There’s cause for celebration at Mail Boxes Etc. Chichester this spring. The team recently won the best-performing agent award in the South East from global money transfer service MoneyGram. The award recognises the MoneyGram agents with the highest increase in transaction throughput in any particular quarter, and store manager Judy Veniamaki and her colleagues were delighted to achieve this milestone in March. Mail Boxes Etc. prides itself on the innovative mix of everyday support services it offers to business and personal customers alike. 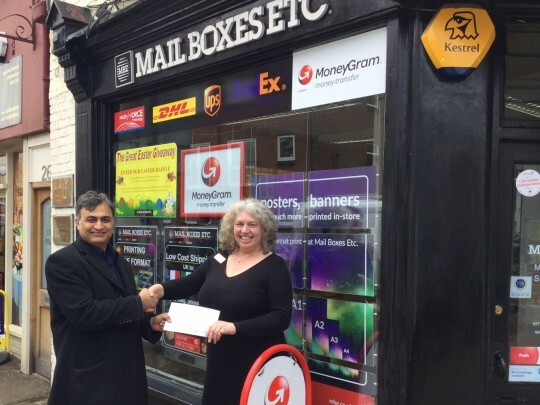 Individual store owners can tailor these services to the needs of their customers, and Judy decided to offer MoneyGram transfers around 18 months ago.